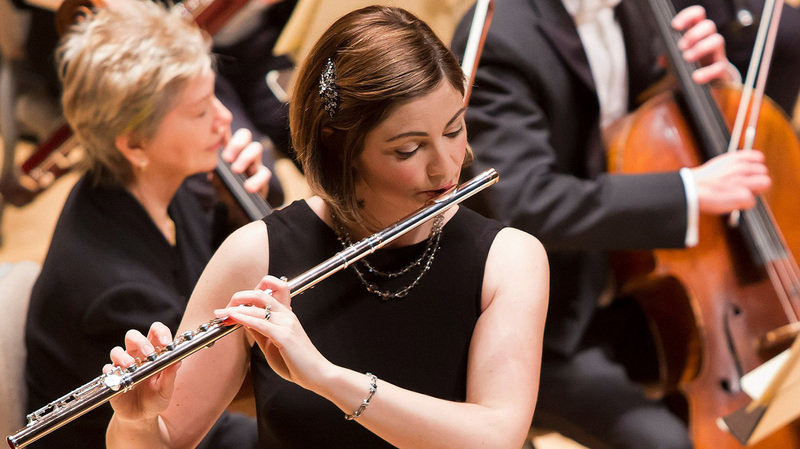 Boston Symphony Settles Pay Equity Suit From Female Musician Elizabeth Rowe, the symphony's principal flutist, filed suit against the orchestra last July. It was among the first lawsuits regarding gender pay gaps filed under a new Massachusetts law. Rowe and the orchestra entered mediation in December, and the case was closed in Massachusetts' Suffolk Superior Court last Thursday. The terms of the settlement have not been disclosed. Rowe was among the first women to file a gender pay-equity claim under the Massachusetts Equal Pay Act (MEPA), which went into effect last July. Her case was being closely followed by the classical music industry as well as by those interested more broadly in gender parity issues. Rowe was hired in 2004 by the BSO — an ensemble widely considered one of the top orchestras not just in the U.S., but worldwide — to serve in this high-profile and extremely competitive position. According to the suit, she has appeared as a soloist with the orchestra more than any other BSO principal musician in the fifteen years since she was hired, and has been heavily promoted in the orchestra's publicity and marketing campaigns. "The Boston Symphony Orchestra and Elizabeth Rowe have successfully mediated the case involving Ms. Rowe's lawsuit against the orchestra. While the details of the resolution are confidential, all those involved in the process are satisfied with the result. The Boston Symphony continues to strive to be an industry leader in furthering the role of women at every level of the organization, including staff, management, and orchestra. Former BSO principal flutist Doriot Anthony Dwyer was a trailblazer when she joined the orchestra in 1952, the same year that the BSO became the first orchestra to implement a blind audition process. This process was designed to promote fairness and to address the issue of gender imbalance, among other issues, in orchestras throughout the country at that time. In the same spirit of improvement and innovation it demonstrated more than six decades ago, the orchestra will continue to collaborate with musicians, staff, and other leaders in the field to accelerate the process of achieving gender parity. The BSO and Elizabeth Rowe look forward to continuing their shared commitment to artistic excellence at the highest level." According to a 2016 study, about 47 percent of musicians in U.S. orchestras were women; the number of female players has improved significantly since the widespread introduction of "blind" auditions in the 1970s and '80s, in which musicians' genders are masked by screens and with carpeting, to muffle the sound of women's shoes. The group's figures are being continually updated as orchestras announce their upcoming seasons; the BSO, for one, has yet to announce its programming for 2019-20.